Hey guys! I was lucky enough to get my little hands on a roast of moose meat from my parents so I figured what better way to use it than in a comforting stew. And it just so happened that hubby gave me an Instant Pot for Christmas so it was like the stars aligned! 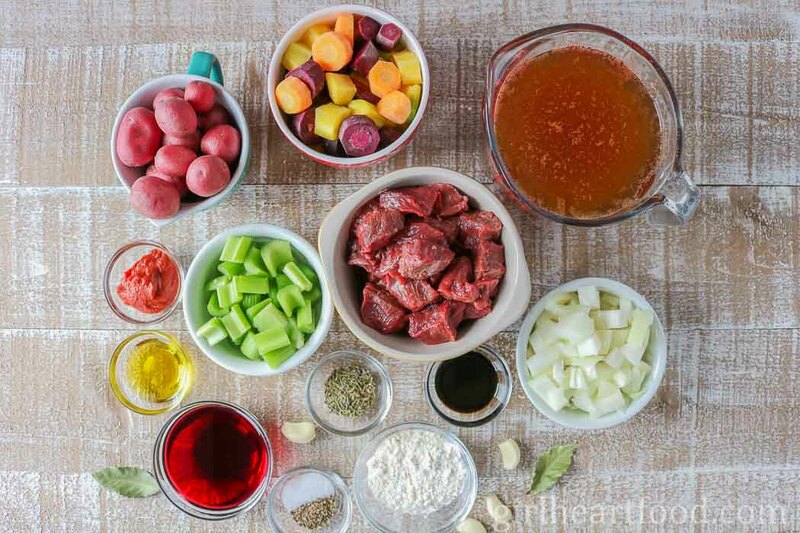 Of course, you could totally make this moose stew in the oven or slow cooker, but it will take hours longer. Not a big deal, but if you are wanting to enjoy this sooner, the Instant Pot certainly helps. You don’t see a whole lot of traditional Newfoundland recipes on here, but I do share the occasional one because they are super delicious! And moose stew is definitely popular ’round here. It’s not something that you would find in local restaurants or anything. It’s typically made at home when moose meat is accessible. I didn’t grow up eating moose and, honestly, don’t eat it a lot now (because it’s not something that one could normally buy in the grocery alongside beef or pork). As a child, I didn’t go for it because it was ‘different’. Ya know, kinda like a kid that won’t eat broccoli because it’s green or something. Funny how we get over that, isn’t it? When it’s available these days, it’s definitely a real treat. 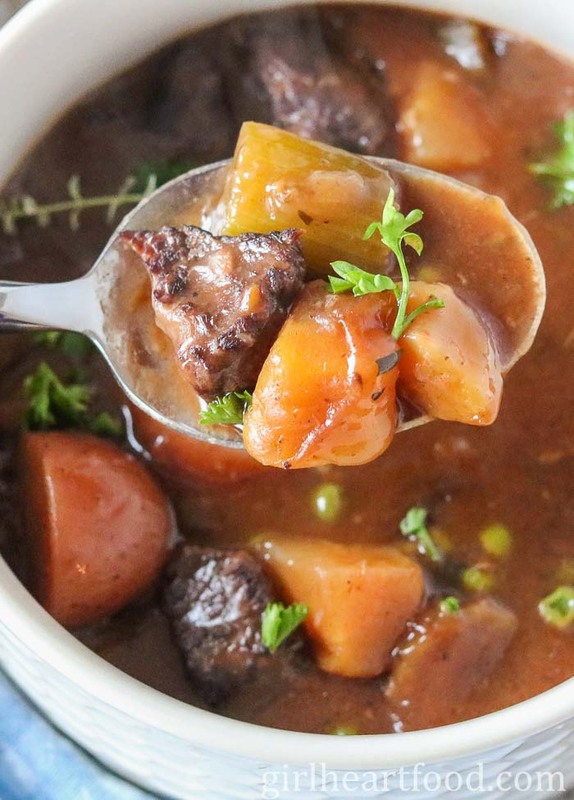 This moose stew is one of those recipes that when you taste test it straight from the pot you end up doing a little kitchen dance. Is that just me 😉 ?? What is Moose Meat? What Does Moose Meat Taste Like? Is Moose Meat Good? Moose is a large member of the deer family. Though moose can be found throughout Newfoundland & Labrador, moose aren’t native to Newfoundland. They were introduced here in the late 1800’s and now they run wild throughout the province. The texture of moose is similar to that of beef, though it’s leaner. If you enjoy beef and other ‘gamier’ meats like deer (venison), then you will probably enjoy moose meat as well. 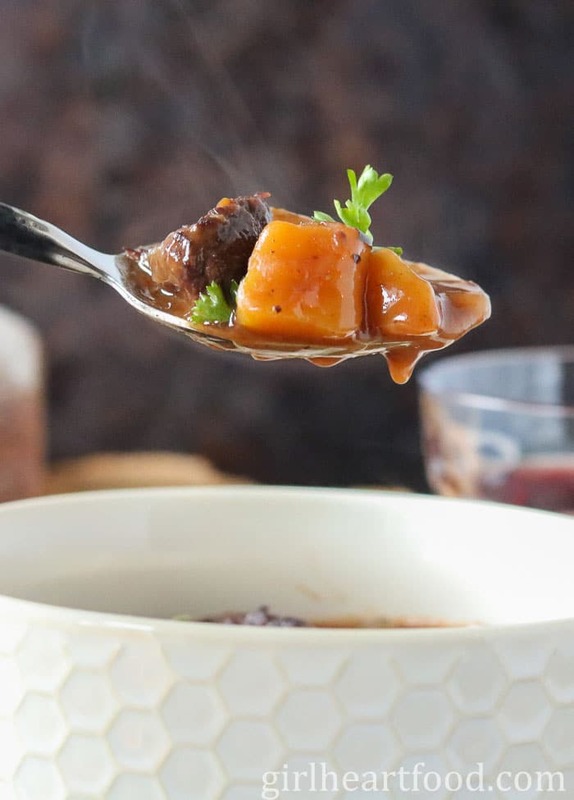 Of course, moose meat was used in this Instant Pot stew, but you could easily substitute with beef if you can’t access moose meat where you are. How to Cook Moose Meat? How to Sear Meat? Cut moose meat into large-ish chunks, about 1.5 – 2 inch chunks. Cut against grain. Trim any silver skin or fat. Pat moose meat chunks dry with a paper towel. Don’t skip this step. This is crucial when searing meat. If the meat is too ‘wet’ it won’t properly sear. Season moose meat chunks with salt and pepper. Add oil to pot on medium heat and place meat chunks in pot. Don’t overcrowd pot or the meat will ‘sweat’ and not sear. Work in batches and add oil as necessary between batches. If meat chunks appear to be ‘stuck’, don’t worry! The meat will release when it’s ready. 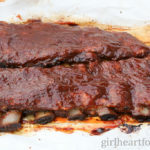 Those crispy bits on the bottom of the pan after searing? Don’t dare throw those out. That’s flavour city right there! Deglaze with wine or stock (scraping them up with an appropriate utensil for the pot you are using) and use those bits in your stew or sauce. To thicken, I used a cornstarch slurry at the end. I used 4 tablespoons of cornstarch with 4 tablespoons of water. Use anywhere from 2-4 tablespoons of cornstarch with equal parts water, depending on how thick you want the stew. After trimming the moose roast, I had about 1.5 lbs of meat. Cut the veggies into large chunks. This works best for stew and for the Instant Pot. As everything is pressure cooked, you need larger chunks so your veggies don’t go to mush. I used red wine to deglaze, but if you’d rather just use stock, that’s a-ok too. Speaking of stock, I used ‘unsalted’ beef stock. If you use anything otherwise, you may have to use less salt than what’s suggested in the recipe. Don’t have ‘herbes de provence?’ Use an equal mixture of dried thyme and rosemary. Don’t have moose meat? No worries! Make this recipe using beef or venison. What to Serve with Stew? Of course, this moose stew is a meal all in itself, but in my opinion you’ve got to serve with a big hunk of bread for dunkin’. Soak up all that goodness, ya know? My friend, Kathy, from Beyond the Chicken Coop has a yummy recipe for homemade white wheat bread. If you want to make it an even more substantial meal, a side salad also works too. Hope you enjoy this easy moose recipe! This Moose Stew recipe is loaded with chunks of moose, lots of veg and it's all bathed in a rich, savoury gravy. Served with a hunk of bread, it makes for one hearty, satisfying dinner. Pat moose chunks dry with a paper towel (this will make for better searing). Season with 1/2 tsp each of salt and pepper. Turn instant pot to Sauté and set for 25 minutes (adjust if you need less or more time to sear), add 1 tbsp of olive oil and brown moose chunks in batches (don't overcrowd pot). Brown about 5-6 minutes/batch, adding 1 tbsp of olive oil (roughly) per batch (I had 3 batches, laying the seared chunks on a plate while continuing batches). Return all moose chunks to pot, along with any reserved juices. Add onion, garlic, 1/2 tsp each of salt and pepper and herbes de provence. Stir and cook 2 minutes. Stir in tomato paste and cook 1 minute. Deglaze with wine. Cook 1-2 minutes. Add beef stock, bay leaves, carrots, celery, potatoes and remaining 1 tsp of salt and 1/2 tsp of black pepper. Stir. Close and lock lid. Set the vent on the lid to 'Sealing' (steam valve in closed position). Next, select the'Manual' or 'Pressure Cook' (high setting) button (depending on which model you have). Select time of 35 minutes (it may take anywhere from 10-20 minutes to come to pressure before the 35 minutes starts to count down). After time is up, allow Instant Pot to 'naturally release' steam before releasing lid (valve will go down when pressure is released). Carefully unlock lid. Stir in balsamic vinegar. Turn Instant Pot to 'Sauté' and set time of 5 minutes. Meanwhile, mix cornstarch (I used 4 tbsp mixed with 4 tbsp of cold water) and stir into stew to thicken. The last 1 minute of cook time, stir in peas. Adjust seasoning, if desired. Remove and discard bay leaves. Portion and garnish with parsley and thyme, (optional). Enjoy! The Instant Pot that I used was the Duo Plus 8 Quart. Cut moose meat into large-ish chunks, about 1.5 - 2 inch chunks. Cut against grain. Trim any silver skin or fat. Pat moose meat chunks dry with a paper towel. Don't overcrowd pot when searing or the meat will 'sweat' and not sear. Work in batches and add oil as necessary between batches. Those crispy bits on the bottom of the pan after searing? Deglaze with wine or stock (scraping them up with appropriate utensil for the pot you are using) and use those bits in your stew or sauce. Don't have 'herbes de provence?' Use an equal mixture of dried thyme and rosemary. I haven’t had moose meat in years! Will have to try beef with your recipe as nobody in my family hunts. Interesting take on stew with tomato paste. Now, I am hungry even though I just ate supper. I was just given a moose roast and this looks like a fabulous recipe to use it in! It’s 400 below outside right now so I need something hearty to keep me thawed out. Thank you for sharing. Hey Dawn, I just wanted to let you know that I made this stew the other night! Fabulous!!! I did sub the moose for elk meat, because that’s what we have. My family loved it! Thanks for a great recipe! I love an Instant Pot recipe, Dawn! And if I had any moose I would use it, but for us its mostly beef. Still delicious! Thanks for the recipe! I was drawn to it especially after seeing “Come From Away” – a musical that takes place in Newfoundland. I’ve been singing “I’m a Newfoundlander!” Ever since! A great show! Thanks for reminding me of it! I know there will never be a moose in Florida. When we lived in New Hampshire, I was always on the lookout for one but never saw one in all our years there. Hunting moose in New Hampshire is done by a lottery and none of our hunter friends ever won a chance at one. All that said, I know I would eat it as I do like other wild game. 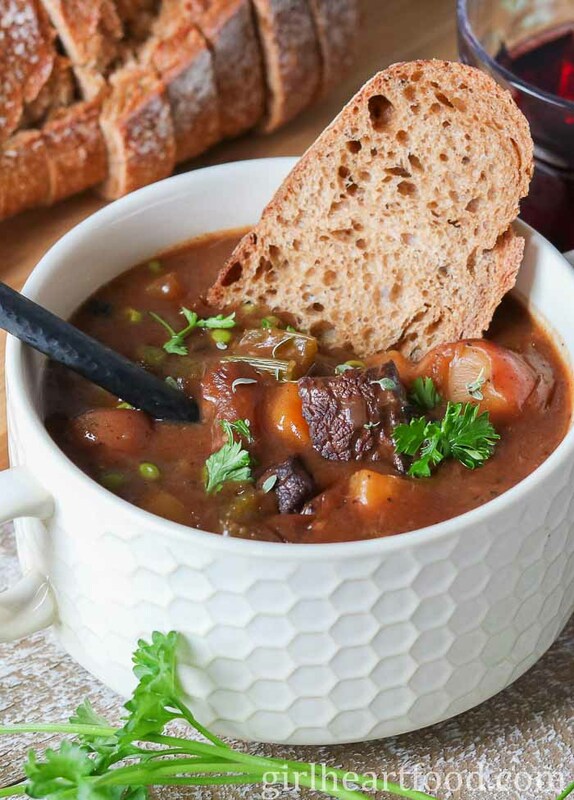 We don’t usually eat moose in our house, but this looks so hearty and comforting Dawn! Such a wonderful Newfoundland recipe! And I love that you used the Instant Pot! Thanks for sharing all of those great tips! Thank you Leanne 🙂 Happy you enjoyed it. I’ve never tried moose, but I’m certain I would love this dish — it’s right up my alley. So many wonderful, deep flavors and such a comfort food. I’m probably one of the last people out there without an Instant pot, but I’m happy to have this take hours in the oven. My house will smell so good! That loaf of bread you’re serving it with looks particularly good, too. And beautiful photos! Lol…wish I could! Thanks so much, Ben 🙂 Hope you’re having a great week! Yay! Thanks so much, Kevin! It is quite the tasty one 😉 So happy you like it. Interesting! I’ve never tried moose, and to be honest I don’t think I’ve ever seen it available around here. (Good tips on subbing in beef, though.) 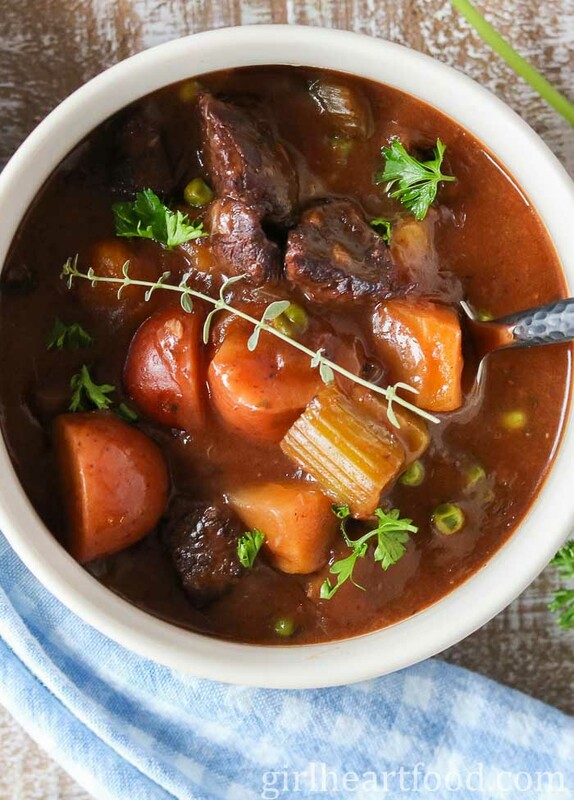 I love a good stew, and this one looks delicious! In fact, Laura and I were just talking about making up a batch of beef stew to help warm us up. We’re running REALLY cold here right now, and a batch of stew sounds awesome. Thanks for sharing these tips on cooking moose. Maybe I’ll get a chance to try moose sometime! Me too, especially this time of year. I sure hope you do get a chance to try it sometime. Bet you’d enjoy it 🙂 Thanks David! It’s not just you–I kitchen dance every time I taste something yummy. It’s gotten bad enough that I can’t eat samples in grocery stores just in case I like it and end up dancing like a fool in public :). I’ve never had moose, nor do I think that’s something I could find in Phoenix so I love that you included substitutions here. Have a great week, Dawn! Lol…happy to hear I’m not the only one 😉 Thanks Kelsie! Have a great week too. Dawn, this stew looks so comforting and delicious! I love your Newfoundland recipes. I have to find me some moose meat! It’s a tad gamier than beef and definitely leaner. Hope you get to try it soon 🙂 Thanks Milena! This stew looks amazing! 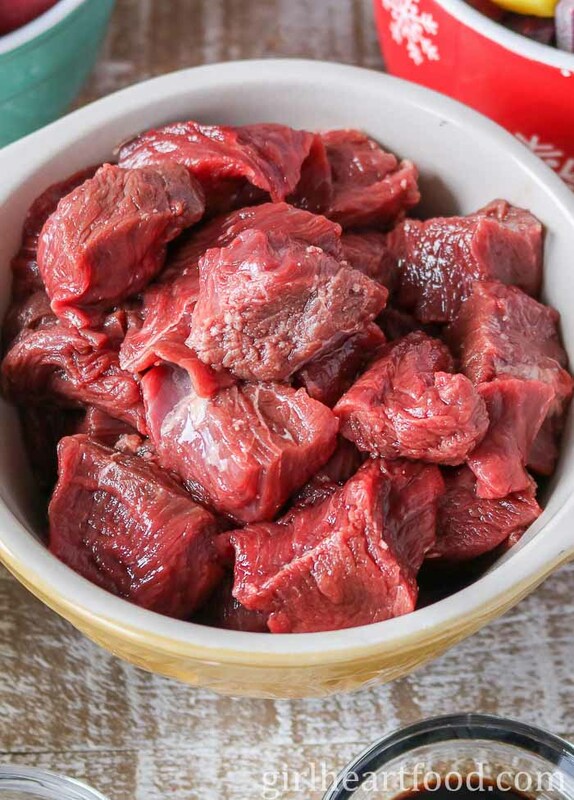 We do eat a lot of wild game meat and I’m always looking for a new recipe and since I also have a new Instant Pot, this is perfect for me! Right now we don’t have any moose meat, but I do have plenty of elk and venison. I think I will substitute one of those for the moose.